Can You believe I finished this challenge already. It was kind of a simple sketch but then the problem was which stamp set to use, after some hemmong and hawing I went with one I haven't used in ages. su Pocket Fun. I used su cs cranberry crisp and old olive and an off white piece that I don't know where I got it. 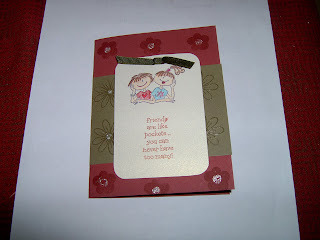 I used cranberry crisp ink for the sentiment and the flowers on the card base. The flowers on the card base are from Papertreys Green Thumb set. I embossed the flowers on the old olive and added stickles to both kinds of flowers for the centers. I also used the gamisol technique for the 2 friends. Ribbon is from Jody Morrow of course. Have a great Day. I am off to work soon. Hate locking up...but someone has to do it. CUTE-ta-boot!! :) Love that set. great job with the challenge.